Please note the information on this website is supplementary to the book "The Schematic of God". If you are requiring more complete understandings, please refer to the book. 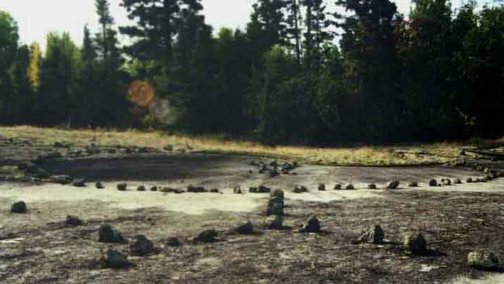 Lights from an ancient sacred site in the Whiteshell area of Manitoba, Canada. 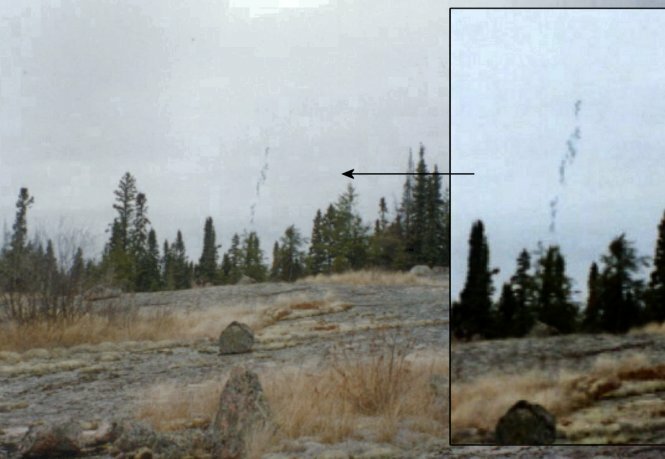 These three lights that are captured on film (35 mm) are said to be the guardians of the site. Lights like this are very common at sacred sites around the world and have led to many legends throughout history. It had been a light rain just before the photo so with complete cloud cover sun glare off the lens was ruled out. No flash was used and the lens was clean. As far as I have determined the shapes inside the lights are the shadows of the tree branches behind the light’s translucent nature. The shadows that are in the lights are extensions of the tree branch shadows. 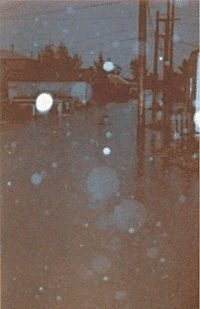 A friend of mine, Heidi Speidel, gave me some pictures of a flood that had occurred in Winnipeg in 1978. She took these pictures just after a very violent rainstorm as she gathered with her neighbors to look at all of the water left behind. One of the things that she recalls about the time is the "weird feeling" that the atmosphere had to it. As well, her neighbors commented on the unusual feel of the air. The picture below to the left is in a back lane off Nairn Ave. The water is about two feet deep. At the time Heidi thought that these pictures were ruined by the developer, but lately more strange pictures have been showing up in her life. This sparked her interest to look back at these pictures. They are interesting to look at, but when enhanced with a computer, things get more interesting. In the back lane picture (above to the left) behind the very bright sphere is an unusual sphere that is behind a fence and a vehicle vehicle. You can see in the pictures to the right that the fence/vehicle blocks out or is in front of the the orb object. 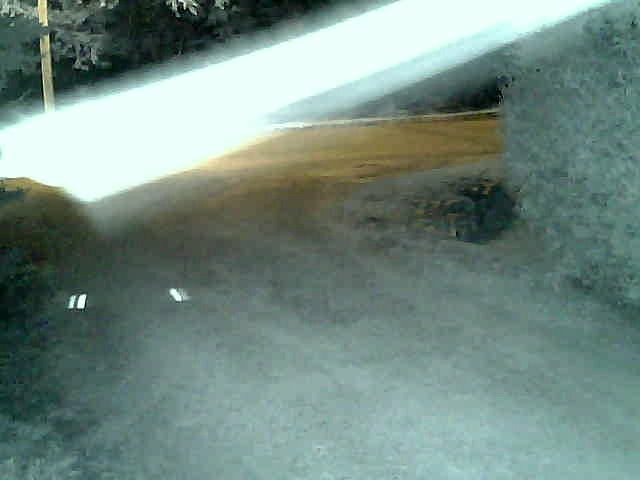 It also appears to be streaking to the right. You will notice a smaller blue sphere in front of it. If this was something spilled onto the negative you would not get "an object appearing to be behind an object" in the scene. 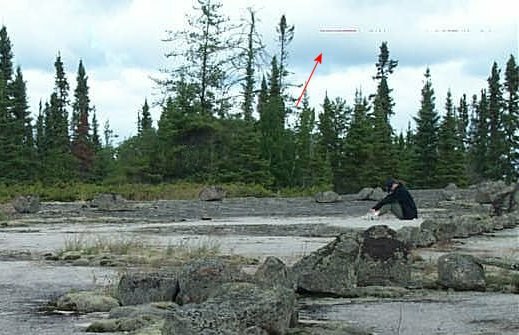 Just after my dowsing workshop at Bannock Point, Heidi's photo of a friend captured another strange light. The time of day is approximately 6:00 PM. The sun is at Heidi's back and there is a 6 foot rock drop-off 8 feet beyond the log. 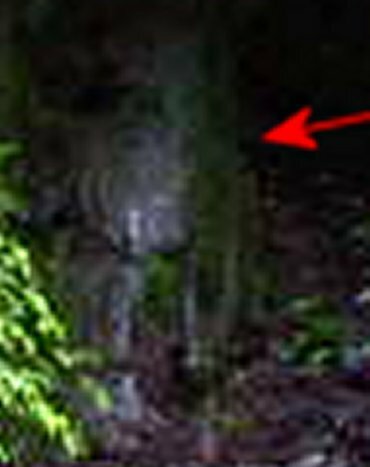 After magnifying the light above the subject's cheek I put the image through different filters to find an elemental hiding on the right side. In these colored versions you can see the two eyes, nose bridge, and mouth of its face. Below is one of the best examples of an energetic dimensional connection being captured on film. 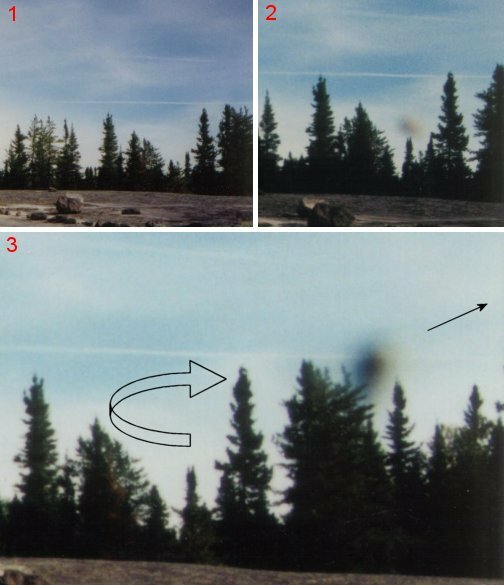 These series of pictures were taken on the West Coast of Canada with the picture to the left "1" showing a distortion taking place in the left upper portion of the picture. 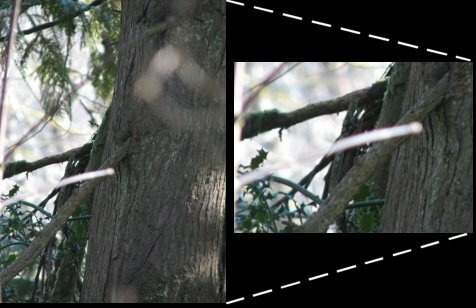 These three pictures were cropped to show just the areas of interest. The camera angle has changed in this back to back series of pictures with "2" not showing the foggy distortion area but the tube energy is appearing. In "3", the distortion can still be seen as well as a descending energetic vortex of energy. The curved nature of the energetic flow is from an effect called ratcheting and is explained in the book "Schematic of God". Ratcheting is the path traveled by energy from one state or level to another. 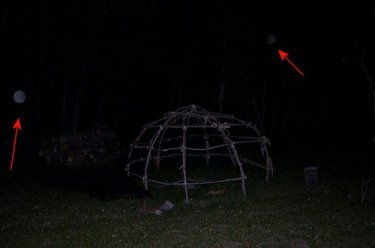 Tie Creek Site, Manitoba -This is not a conventional orb but could be referred to as a UFO. 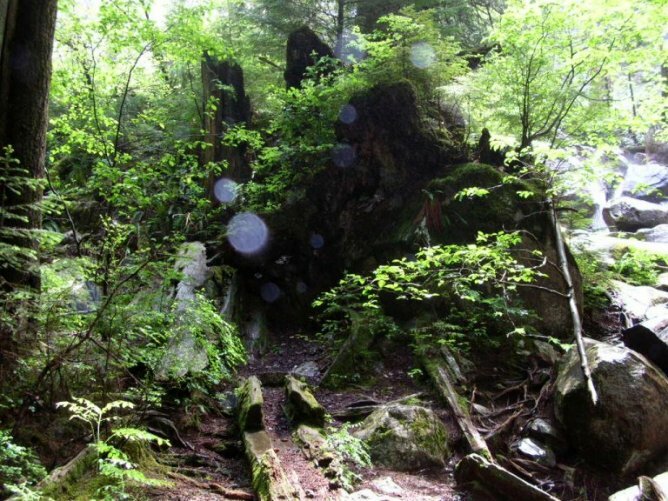 My first visit to Goldstream Provincial Park, BC , picture taken beside a 600 year old tree. 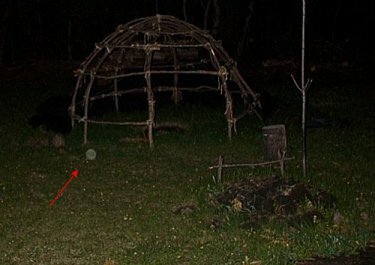 Orbs and energy - Energy forms in above picture, the small one is magnified to the right - looks like a native mask or totem! Tie Creek Site guardian, intimidated by this person’s power and being there with me. Picture below was taken years prior and on the same energy line, facing north-east. St Adolphe, Manitoba - July, 2015 a driveway security camera activates - time lapse is 1 second per frame. © - You are welcome to use any of these pictures, as along as you give credit to the source – this website. Like most rational people, he assumed that the pictures were faulty. "I presumed the circles were due to dust particles, flash anomalies, water particles and so on," says Prof Heinemann. "But I was sufficiently intrigued that I returned to the room in which the pictures were taken, in the hope of finding an explanation - like a mirror in the background. None was forthcoming." But again, Prof Heinemann ruled out a technical fault. "We were quickly able to eliminate the common problems associated with photography - such as dust particles, water droplets, reflections and a host of other likely causes." 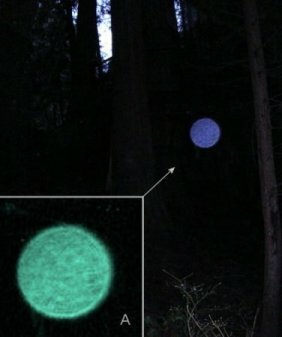 "There is no doubt in my mind that the orbs may well be one of the most significant "outside of this reality" phenomena mankind has ever witnessed," says Professor Heinemann. 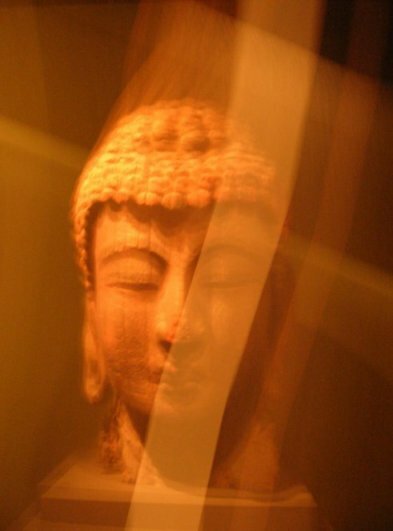 "Until now, there has been a huge amount of anecdotal evidence that the spirit world exists. I believe it's no longer anecdotal. Thanks to digital technology, we can see it for the first time. We are dealing with a non-physical - albeit real - phenomenon." "Most great discoveries throughout history have been initially ridiculed," Ledwith told the orbs conference. "To my mind, there is no doubt that the orb phenomenon is real and deserves to be taken seriously. 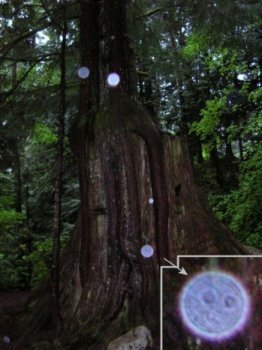 There are not just a few pictures of orbs, which could easily be faked, but hundreds of thousands from all over the world." "Over time, I realised that a flash seemed to be essential to capture them, even in daylight. 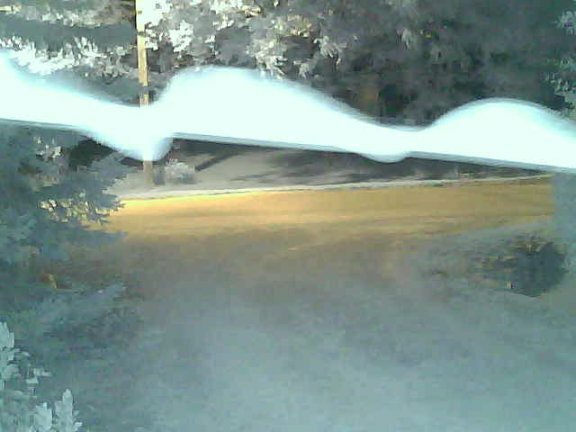 I believe this is because we can see the orbs only through the process in physics known as fluorescence. 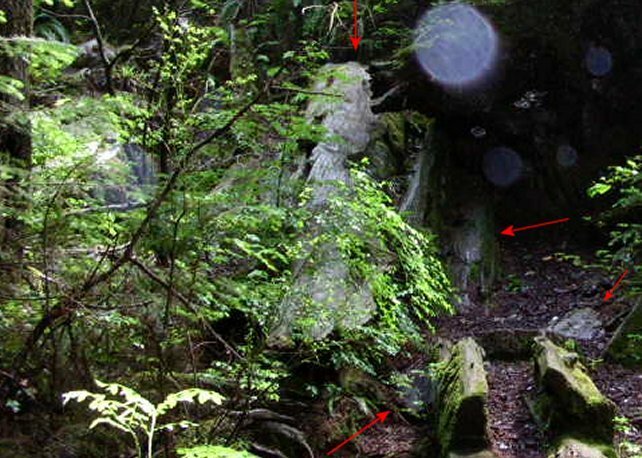 The camera flash sparks this fluorescence process, making the orbs visible to the camera." "I believe they could be many things. They may turn out to be the spirits of those who have passed on; or, as some spiritual teachers state, they might be spirits waiting to be born into a physical body," says Ledwith. "They may also be, or represent, a host of other intelligences - from nature spirits to beings of pure energy that have never been incarnated in a physical form. There are hundreds of different types of orb." It's certainly the case that they can often be photographed best at places of psychic significance. "They definitely seem drawn to spiritual type gatherings," says Ledwith. "We regularly see orbs near healers' hands or heads. Perhaps they assist in the spiritual healing process." The shoot took place at the exact spot where Sarah was last seen, because the medium had suggested that he "might pick something up". 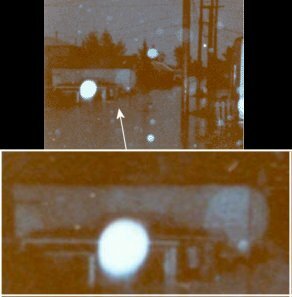 Sure enough, when the pictures were developed, a mysterious glowing dot appeared in one of the crucial images. "I didn't believe in any of this paranormal stuff," says Anna, "but I couldn't find any fault with the camera - if there had been, then all the images would have been tainted, not just one of them." "So what I now had was pictures of orbs from three different cameras, in two different countries, on three different days - there's simply no way that could be a chance occurrence or a technical fault," says Anna. 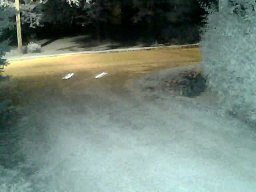 "I still don't know what to think about it, but I suppose because a camera can pick up an image at a shutter speed of 1/2,000 of a second, it's possible it can detect things the naked eye cannot see." 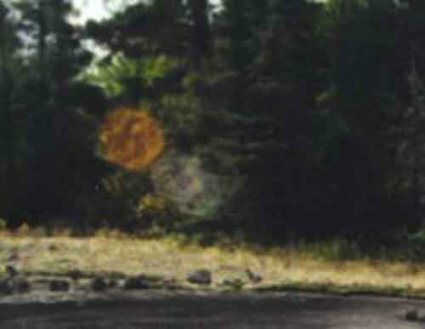 "We feel that a large majority of so-called orb pictures are too readily attributed to some form of paranormal phenomena when, in fact, stray reflections in uncontrolled environments often produce orb-like images," he says. That does not deter those, like Miceal Ledwith, who feel orbs are simply too widespread to be written off as a misunderstanding. "The orbs are an everyday part of reality, as much as we are," he maintains. "Their world may be as real as ours, but exists on higher frequencies. 'If you change your TV channel, you switch to different frequencies, which contain different information. It's illogical to think that what we cannot see is not real, because the human eye is able to receive only a very narrow part of the light spectrum. Many animals can see in spectrums invisible to us." As Professor Heinemann summarised: "Research into orbs is only in its infancy. 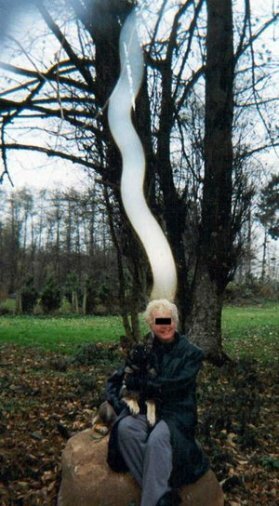 But the photographs of these spirit emanations offer evidence - as close to scientific proof as we have ever come - in proving the existence of spiritual reality." • Klaus Heinemann's and Miceal Ledwith's book, The Orb Project, will be published by Simon & Schuster in November.